Buckhannon City Hall is located at 70 East Main Street, Buckhannon, WV 26201; phone: 304-472-0934. Photo: William Post Mansion, ca. 1891, 8 Island Avenue, Buckhannon, WV. Listed on the National Register of Historic Places in 1993. Photographed by User:Jerrye & Roy Klotz, MD (own work), 2016, [cc-by-4.0 (creativecommons.org/licenses/by-sa/4.0/deed.en)], via Wikimedia Commons, accessed December, 2016. Buckhannon is the county seat for Upshur County and the only incorporated town within the county. The county was formed from parts of Randolph, Barbour and Lewis Counties on March 26, 1851, with Buckhannon selected as the county seat at that same time. The county tried to form before 1851 but the other counties objected to having their own counties reduced in size. The county was named for Abel Parker Upshur, a Virginian statesman and jurist. Upshur served under President John Tyler as Secretary of State as well as Secretary of the Navy. The town of Buckhannon was officially incorporated May 1852 by an act of the Virginia Assembly. Buckhannon is located on the Buckhannon River at the junction of State Route 20 and US Route 33 in the north central portion of Upshur County. The first settler to be noted was Edward Jackson and his family in 1770; they built a rough log house on the bank of the river. Buckhannon's first post office was established in 1804 with John Jackson Jr. serving as the first postmaster. The first school was conducted by Samuel Hall in 1807. The town was surveyed and platted in 1815 with 30 lots; eighteen of the lots were sold for $25.00 each. Daniel Farnsworth built the first house in town in 1822 and the first election was held in his house in 1829. In 1822 the first Methodist Church built in Buckhannon was the old Carper Church, thus establishing a long tradition of Methodism in Buckhannon. The William C. Carper House is extant within the district (ca. 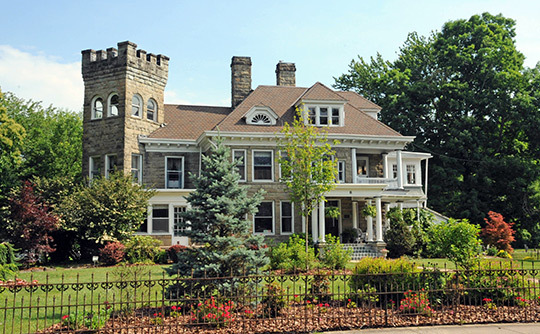 1890), and is located at 99 South Kanawha Street. The original Carper homeplace was located on the grounds of West Virginia Wesleyan College and the Carper family graveyard is still on the campus. In 1847, the Staunton-Parkersburg Turnpike was completed through town and this is now Main Street. The original corporate limits of town were from Fink's Run to Jawbone Creek and by 1865 the population was about 600. Anmap of Buckhannon from 1871 shows the courthouse and development only along Main Street. George R. Latham was a significant figure in Buckhannon's early history. He was born near Haymarket, Virginia, studied as a lawyer, and was admitted to the bar in 1859 when he began his practice in Grafton, Virginia (now West Virginia). He served as Delegate to the Wheeling Convention in 1861 and served as a Captain in the Union Army of Company B, 2nd WV Volunteer Infantry Regiment, which he organized. He was later promoted to Colonel and then served in the US House of Representatives from 1865-1867. Later positions included consul to Melbourne, Australia from 1867 to 1870; Upshur County School Superintendent from 1875 to 1877; and supervisor for the first census division of West Virginia. He was also a farmer in Upshur County and maintained his home on Madison Street until his death in December 1917. He is buried in the Heavner Cemetery in Buckhannon. Jean Boger, Assistant, Michael Gioulis Historic Preservation Consultant, Inc., Buckhannon Central Residential Historic District, Upshur County, WV, nomination document, 2011, National Park Service, National Register of Historic Places, Washington, D.C.